This matter is receiving attention and the church officials as a preliminary step are considering the best means of perpetuating the memory of those gallant men from our parish who have made the supreme sacrifice. There is a tendency to look at the matter from a utilitarian point of view. We have our doubts that this is the proper way to remind coming generations of loyalty to our country and deeds of valour worthy of our best traditions. Our readers may rest satisfied that in due course we shall be in a position to announce something more definite. In the meantime they may think the matter over and see to what extent they shall be able to help. This story is largely told through the items that appeared in the Parish Magazine at the time. These were presumably written by the Vicar, Rev. Vaughan. Northop Parish Magazine May 1919Northop Memorial to our Fallen HeroesThis is now engaging our attention. A public meeting was held at the school to take the matter into consideration with Sir John E Bankes in the chair. The Chairman pointed out that we should avoid mixing up two things when we deliberate over this matter. – viz memorial for the dead and thank offering of the living, for the living. The two are quite different and should be kept quite separate. We believe there is a general feeling that amemorial to ALL our fallen heroes from this parish should be put up in the Parish Church and it is only natural that it should be so. Where more fit? When we endeavour to perpetuate the memory and deeds of our friends we always look to the parish Church as the BEST place We very much hope we shall have unanimity and that all concerned will agree as long as this need not interfere with any local arrangements. 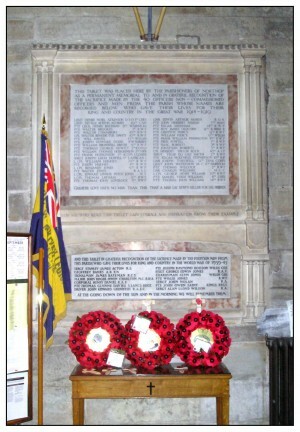 At a meeting held in the school at Northop when representatives of all the various places of worship in the Parish and members of existing local committees were present, it was unanimously agreed that a united effort be made to place a tablet in the Parish Church with the names of all from the Parish who had fallen in the war. As the representatives who attended had to report we hope that the next meeting to be held on June 2nd, a decisive step will be taken that a fund will be opened for the purpose and opportunity given to all to contribute to thus perpetuate the memory of those who gave up all in this life for their country. We venture to think that no better step could be taken and we think all will gladly contribute. Northop Parish Magazine July 1919Parish War MemorialIn a former issue we referred to this matter and expressed a hope that means would be found whereby all our parisioners would join to erect one memorial with all the names of those from the Parish who had made the supreme sacrifice inscribed thereon. At a meeting held in Northop school on June 2nd when representatives from various parts of the Parish were present, the matter received full and sympathetic consideration. It was unanimously passed that a memorial tablet be erected in the Parish Church at the approximate cost of £100. In adopting this course we feel sure that the wishes of many will be met and the right thing be done. There are many advantages of having the tablet placed in the Parish Church that we need not mention here further than in our opinion no better place could be found. Steps are now being taken to carry out the recommendations of the Committee. We venture to hope that every care will be taken to choose a fitting design and that it will be artistically done, worthy of place and object in view. Mr Read, Northop Hall has been appointed treasurer and subscriptions may be sent to him or Mr Herbert Watkinson Brook Park, Chairman of the Committee. At a united service held in the Parish Church on Saturday May 29th at 7.30pm the tablet was unveiled by Lord Justice Bankes in the presence of a large congregation. Its position is a happy one for it is set in the tower, well lighted by a window almost facing it and can be seen by all who enter the main door. The tablet itself is of white alabaster with Ancaster stone. The whole is in keeping with surroundings and will serve to inspire those who follow. The sculptors were Messers Haswell and Son, Chester and they deserve great credit for the satisfactory manner in which they have executed the order. Northop Parish Magazine August 1920Parish War MemorialThe final meeting of this Committee was held on July 12th with Mr CL Williams in the Chair. Statement of accounts was submitted by Mr JC Read, Treasurer showing total subscriptions and expenses amounting to £149 .. 5s. It is satisfactory to feel that the Tablet erected in the Parish Church will help to keep green and fresh the memory of our gallant heroes and we will trust inspire others to follow their noble example. As the Church is open daily from 11 to 5, ample opportunity is offered for seeing the Memorial.